The Friends of L. Ron Hubbard Foundation announces the newly released "L. Ron Hubbard Series" available to libraries across the United States. The L. Ron Hubbard Series is the complete biographical encyclopedia chronicling the life and legacy of L. Ron Hubbard. The beginning of 2013 marked the completion of some 16,000 sets of the newly released “L. Ron Hubbard Series” being made available to libraries across the United States. The new series released for the Centennial of L. Ron Hubbard’s birth is a complete biographical encyclopedia consisting of 16 volumes chronicling the extraordinary life and vast magnitude of L. Ron Hubbard’s life and many achievements. Most widely known as the Founder of Dianetics & Scientology, L. Ron Hubbard was also professional as a master mariner, photographer, cinematographer, adventurer/explorer, poet/lyricist, film maker, horticulturist, humanitarian and one of the most widely read authors of modern times. His achievements and legacy left in many different fields are depicted through 16 volumes, 3,500 pages and over 1,000 historical photographs of Mr. Hubbard’s life, works and travels. Patrons of libraries nationwide can now learn of Mr. Hubbard’s life with the new series which features never before seen photographs, his personal journals, articles, essays, personal letters and artifacts all indexed in each volume complete with extensive glossaries. Also included in the set is the stunning photographic chronology that presents the intimate story of L. Ron Hubbard’s life through the meticulously restored “Images of a Lifetime” with detailed anecdotal captions. Libraries across the United States have warmly welcomed the series, which in many locations have significance as landmark locations in L. Ron Hubbard’s life. Take Seattle, Washington for example where L. Ron Hubbard started his scouting career to become the nation’s youngest Eagle Scout or Phoenix, Arizona, which is the birthplace of the Scientology religion and home to his Camelback residence, which is now enlisted on the National Register of Historical Places. Another, New York where L. Ron Hubbard has 19 New York Times Bestsellers to his name and where he also became a member of the famed Explorers Club. For more information on L. Ron Hubbard and his works visit http://www.lronhubbard.org and for more information on this new series of books available in libraries across the United States email friendsofron@earthlink.net. In the United States alone there are a total of 16,000 libraries with all 16 volumes of the “L. Ron Hubbard Series” being made available to libraries from coast to coast. With all 16 volumes of the “L. Ron Hubbard Series” being made available to some 16,000 libraries across America, the manufacturing alone took 14 truckloads of paper, 16.5 million feet of paper, 400,000 pounds of printed materials and over 250,000 books all produced and distributed by Bridge Publications Inc, the non-fiction publisher of Mr. Hubbard’s works. 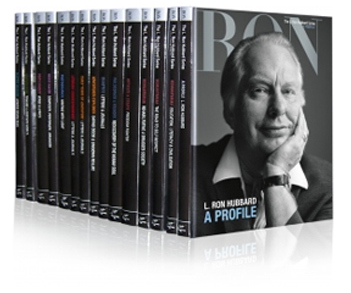 The full L. Ron Hubbard Series includes: L. Ron Hubbard: A Profile, Humanitarian: Rehabilitating a Drugged Society, Humanitarian: Education, Literacy & Civilization, Humanitarian: Restoring Honor and Self Respect, Freedom Fighter: Articles and Essays, Philosopher & Founder: Rediscovery of the Human Soul, Dianetics: Letters & Journals, Adventurer/Explorer: Daring Deeds & Unknown Realms, Early Years of Adventure: Letters and Journals, Writer: The Shaping of Popular Fiction, Literary Correspondence: Letters & Journals, Music Maker: Composer & Performer, Poet/Lyricist: The Aesthetics of Verse, Photographer: Writing With Light, Horticulture: For a Greener World, Master Mariner: At the Helm Across Seven Seas.